10/8/15 UPDATE: This item and my October 4 letter to the FDA were based on a September 29 e-mail I received from FDA public health advisor Bonnie J. Alderton stating "(LifeVac's manufacturer) has registered their establishment with the FDA and listed the device they intend to market. However, the device currently does not have FDA marketing clearance." Upon further investigation, I have learned these devices, while they are Class II, are EXEMPT from the premarket notification (510K) process. 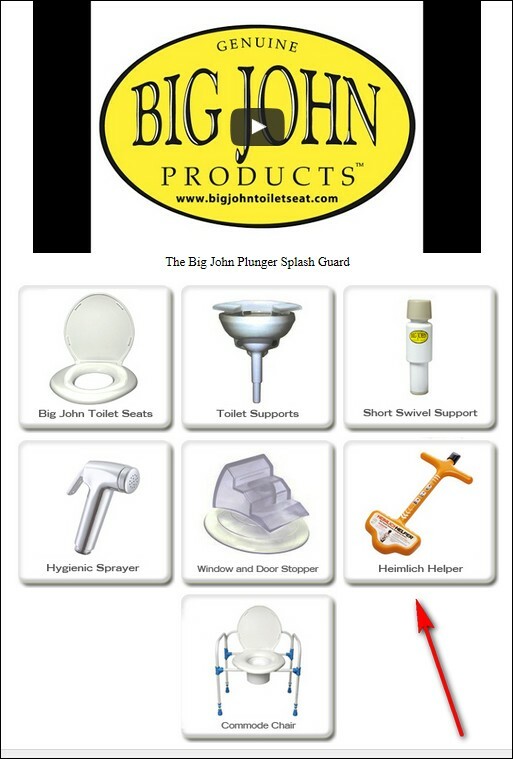 Therefore, they are only required to register their establishment and list their product...Again, Lifevac has registered and listed with FDA, however I find no record of registration or listing for Big John Products. No thanks to Alderton for wasting everybody's time, but I predict more to come in the "LifeVac" and "Heimlich Helper" stories. My original item is between the hash marks. Click here to download a copy of my October 4, 2015 letter to the FDA. Page down for promo videos for each device. Re: the "LifeVac," per my letter, reportedly the Sarasota Police Department and two municipal fire departments on Long Island -- Jericho and Brentwood -- have purchased the device and presumably are using it on the public. The "Heimlich Helper" promo video stars actor/comedian Marc Price who played "Skippy" on the TV show Family Ties.